At Alderidge, we take care of many different components of a person’s home, but we have found that we go through stages where we are on a specific task on many different jobs at the same time. 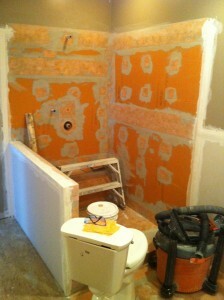 Lately we have been performing quite a few bathroom renovations. We have been doing a lot of tile setting, and before tile setting comes the ripping out of old showers. Some old showers have been in ok shape (just outdated and minimal water damage), but with other showers we have found significant signs of water egress behind ceramic tile surfaces. How can you as a homeowner ensure that your new shower is going to be waterproof for years to come? We believe in the quality of “Schluter” products and specifically the “Schluter Membrane” system. If installed correctly this product is water tight and is a far superior product in comparison to some other water proofing applications (though without taking a specific course with Schluter on the application of the product, install is not recommended). Many times in a bathroom a specific shower base size cannot be found, and to make the bathroom space the most effective, a customer would prefer not to be limited to the measurements of a specific shower pan size. The Schluter Membrane can be used for those unique shower shapes and sizes. These photos and short video clip weren’t made specifically for this blog, but at least they show what the product looks like. These were taken on a job that Erik Toews is currently working on in Abbotsford (Eagle Mountain). If you would like to talk to someone about a bathroom renovation and getting a Schluter system installed in your shower, give us a call at 604-626-2480 or fill in our short contact form so we can get you the help you need.